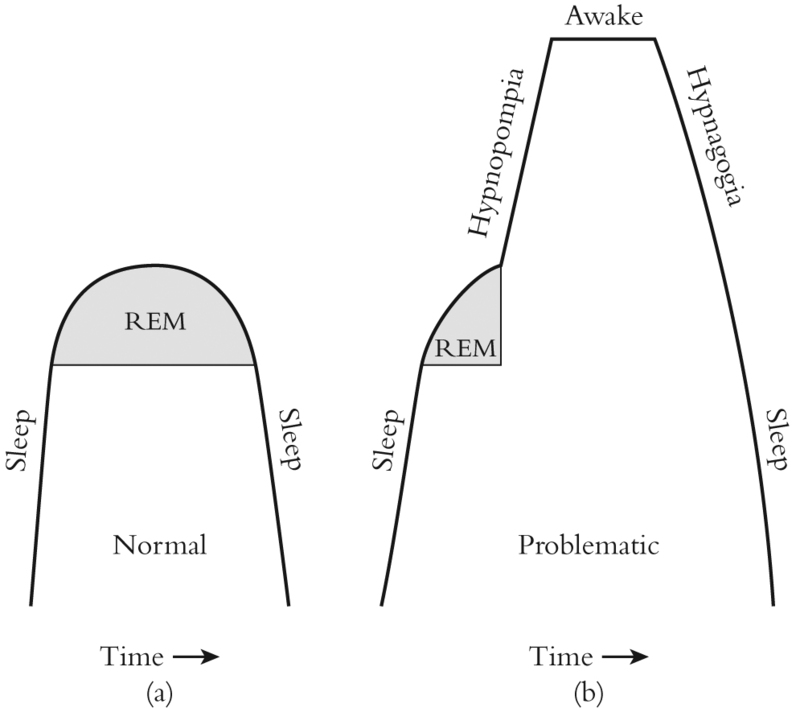 Hypnopompia means roughly “to lead out of sleep.” Hypnopompia occurs on the far side of a sleep cycle, i.e., on the other side of REM, as shown in Figure 7-1, which shows just the upper portion of a sleep cycle from Figure 2-1. Hypnopompia has been studied even less than hypnagogia. Some scientists do not even accept it as being separate from hypnagogia because of similar EEG waveforms. I treat it as a separate state because the psychic experience is different. Normally, we go through REM and return to sleep, as shown in Figure 7-1a. Problematic sleep, shown in Figure 7-1b, goes from REM to a transition stage to being awake. This transition state is called hypnopompia. We then remain awake for a while and again go through hypnagogia on our way to sleep. Hypnopompia, which is in some ways the mirror image of hypnagogia, has superficially much the same properties as hypnagogia, just in reverse order: sleep-to-awake instead of awake-to-sleep. Here is the crucial element that makes hypnopompia very different from hypnagogia. In the initial stages of hypnopompia, we are right up against REM dream images, whereas in hypnagogia, we go from being awake into the initial stages of sleep. As soon as we realize we are waking up, we can use those residual dream images to lead us back to sleep. It should be possible to transition back to dreams and then to deep sleep instead of waking. Waking is only normal when we are at the end of the last sleep cycle, the very last REM. This technique involves capturing real-time dream images and holding them in consciousness until the dream resumes. If the dream stalls out or ends, you can extend the dream by fantasizing it on into the future. I have investigated this technique of trying to get back into REM and then back to sleep many, many times and have found it very helpful. However, this approach is not without its problems. Dreams are stories frequently with a lot of emotional content, and we might use the storylines to extend hypnopompia almost indefinitely. We can get involved in extending the dream and become so absorbed in that emotionally laden world that we never make it back to deep sleep. Sometimes dreams are fun to play with, but if your object is a good night’s sleep, you don’t want to get caught up in prolonging the transition state. Dreams can be more emotionally powerful than we realize. I had a dream once where I was crying both in the dream and in the real world. The dream was so painful that it woke me quickly, so quickly that I experienced hypnopompia over a matter of seconds. The sadness I experienced was so powerful it was shocking. It was unbearable grief. But as I woke over a matter of only two or three seconds, the grief evaporated. It was as if a door to my emotions had closed. This was in the middle of the night and occurred during my second REM. We have little memory of these early REM states and remember dreams mostly in the last two sleep cycles. If you do wake quickly from an early REM state, the hypnopompia following can be disturbing, and you might want to get fully awake before trying to go back to sleep. Sometimes we need to reset our psyche. Sleep experts say that if you wake and can’t get back to sleep to turn on a light and read, or perhaps even get up and walk around while performing some menial activity. I argue against this, except in all but the most extreme conditions such as that I described in the previous paragraph. If you have had a nightmare, undoubtedly it is good advice. Under these unusual conditions, it seems that we are waking up fully because the dream was too emotional to handle, and we need to reset sleep by fully waking. If we allow the dream to end and become fully awake, we can then use our emotionally benign Transition Trek to go back to sleep and hopefully under more pleasant circumstances. I have also had times when sleep seems disturbing and abusive, as if something chemically has gone wrong, so I turn on the light and find an activity to take me fully out of anything to do with sleep. I need to reset my psychic state. But those times are rare. If you need a reset, do it, but don’t make a habit of it. This can have a negative impact on your sleep propensity curve. You should reentering the Transition Trek instead and concentrate on images. As I was finishing up editing this book, I dreamed that I was on foot in a road beside an open field that at one time had grown crops but was now fallow. One of the guys I was with shouted for me to look at what he had found in the field. It was a huge earthworm, perhaps forty feet long and maybe ten inches in diameter at the waistband. It was all stretched out in a furrow, but when I ran onto the field to take a picture of it, it took off. It was fast, moving something like a snake and also something like an inchworm. I chased after it but couldn’t keep up. The worm disappeared into some rundown buildings and pens where sheep were running loose, but the giant worm had transformed into a lion. I became concerned, but the woman with the sheep told me to always find the mother, and I would be all right. It seemed that she was talking about the mother of the sheep, and the worm-turned-lion seemed to have disappeared. I almost woke then, or perhaps I did wake. At least, I was conscious of dreaming but at the far edge of the dream rather than lucid dreaming. I didn’t realize it at the time, but I had just entered hypnopompia. And this is what makes hypnopompia so much different from hypnagogia. I was both dreaming and awake. I would dream, become conscious that I was dreaming, and then wake again. I started working with the dream, semiconsciously, but nevertheless, the will of the dream, so to speak, and my own will started to intertwine and change the course of the dream. The woman had a husband and they were both police officers. She showed me her badge. She was the head of some police organization, yet here they were living in this dilapidated structure, herding sheep. They were cleaning up the ruined building to live in and were a bit ashamed of their situation. Seems I was going to stay with them a while and offered to get some food. They were appreciative of my help. The dream began to stretch out as I went in and out of sleep. At times I would be fully dreaming, but at others, I would be consciously extending the dream and changing it as I wished or it evolved on its own. The dream seemed to go on for two hours or so and became much more fantasy than dream. The man was no longer there. She and I were building a life together in the ruins at the edge of civilization. I became more and more awake, and the dream became complete fantasy. I was enjoying living in the mood of the dream. A few times I tried to use a Transition Trek to get myself back to deep sleep, but even though I did get back in REM, I couldn’t get back into deep sleep. However, I didn’t have any pressing activity that needed my attention later that morning, so the amount of time I spent in hypnopompia was not disturbing. The sleep I got the last couple of hours was not as beneficial as it would have been if I had been in deep sleep instead of hypnopompia for the predominance of the two hours this was going on. Yet, we should not expect the last couple of hours of sleep to be as deep as those of the earlier part of the night. That is the nature of sleep — deep in the first part of the night and shallower during the second part. This reminds me of the “dead sleep” and “morning sleep” before electricity mentioned in Chapter 1. This is the nature of hypnopompia. This is what makes it so different from hypnagogia. I have done this many times during the last couple of decades. The intermingling of consciousness with the deep resources of the unconscious is what makes hypnopompia such a valuable resource and so troubling if you want to stay asleep. Even though I didn’t try to resolve an issue or work on a creative project, I could have. I have done that many times also while in hypnopompia. Having exposed many of the normal impediments to sleep and how to solve them, we now come to an even more serious problem. Some people believe they will die if they go to sleep.